Our collaboration with device-level researchers at both MIT and Cornell enable us to study the best way to leverage nanophotonic devices in future processors [IEEE-MICRO'09, NOCS'09, ISCA'10]. The images on the left illustrate waveguides, modulators, and filters fabricated by researchers led by Prof. Vladimir Stojanović, Henry I. Smith, Judy L. Hoyt, Franz X. Kärtner, and Rajeev J. Ram at MIT. 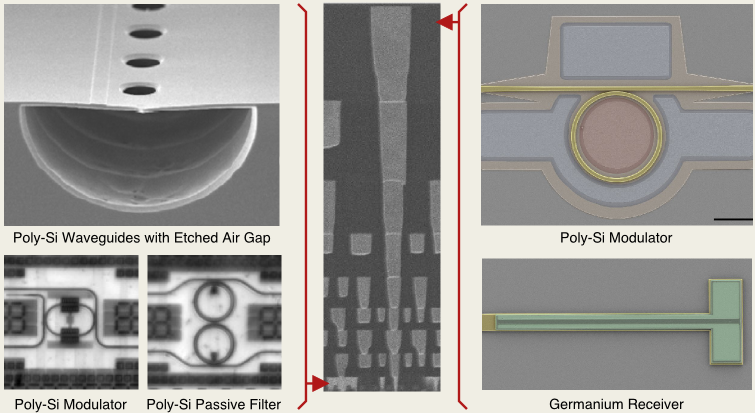 This approach uses front-end-of-line integration without any modifications to a standard CMOS process flow, except for a final post-processing step to create an air gap under the waveguides for better optical confinement. The images on the right illustrate modulators and receivers fabricated by Prof. Michal Lipson's group at Cornell. This approach will eventually use back-end-of-line integration to deposit devices on top of the metal interconnect stack. Either approach could eventually enable chip-level interconnects with improved energy efficiency and bandwidth density compared to projected electrical technologies.